The Romp and Roost Playard provides a safe place for one or two children to nap and play. The stylish, oversized playpen or sleep space can be divided for twins or two toddlers to provide two cozy areas. The divider can be removed to allow one large baby playpen for one or two children to play independently or together. With the divider out, it can sleep one large toddler or small children with plenty of room. 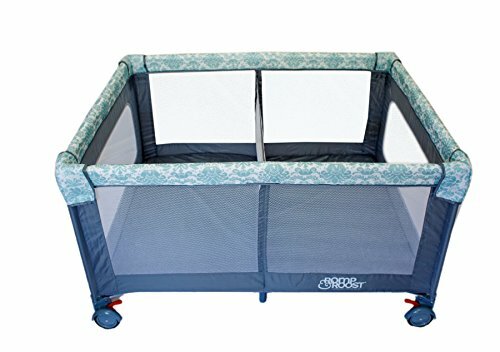 This portable baby play yard is great for travel and comes with a soft, waterproof sheet with zipped-in divider to accommodate the Romp and Roost mattress. It is surrounded with an airy mesh material that provides maximum ventilation. This twin pack n play is twice the size of the standard playpen for babies. This item comes complete with a handy carry bag. DUAL PURPOSE DESIGN - Stylish, oversized playpen or sleep space for 1 or 2 children. PERFECT FOR TWINS - A removable patented divider separates oversized area into two spaces if desired. PORTABLE - Large wheels with brakes and carrying bag makes it perfect for travel. QUALITY MATERIALS - Surrounded with an airy mesh material that provides maximum ventilation. INCLUDED - Comes with a soft, waterproof sheet with zipped in divider to accommodate the Romp & Roost mattress. If you have any questions about this product by CappyBug LLC, contact us by completing and submitting the form below. If you are looking for a specif part number, please include it with your message.